"In our 24/7 world we are overwhelmed with choices, rushing to decide and to act. Nance Guilmartin's interesting and lively book teaches us to pause, reflect calmly, assess the real options and then launch our solutions. She's right. It works. " 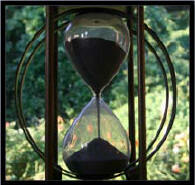 We don't' have time to waste clearing up the "missed understandings" that can happen - to ANYONE - at a moment's notice. We need ways to help one another work better together at work, at home and in our neighborhoods. We can use a mental GPS system - The 3-step Power of Pause process - to locate a new attitude to keep us from jumping to the wrong conclusion (and down someone's throat) driven by thinking we're right and someone else is wrong. 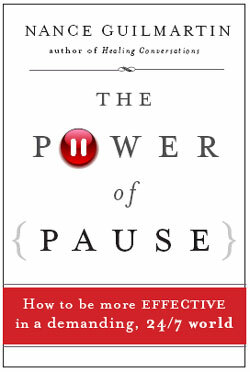 "The Power of Pause is a great tool for us in these changing times. It helps us avoid the problems that ‘continuous partial attention’ and multi-tasking create and shows us how to think things through and achieve what’s important." Spencer Johnson, M.D., Author #1 New York Times Bestseller Who Moved My Cheese? co-Author, The One Minute Manager. "By using the Power of Pause I’ve become a better teacher, a better mom and a better friend. I’m more relaxed in stressful situations because I’m confident that I will respond thoughtfully and effectively." Fox Morning News interviewed Nance about the power of a pause in tough times. "Dealing w/ Co-Workers"
- with less stress - at work and at home & help others be their best, too! to get control of my 24/7 world." Suzane Rothwell, Esq. "I plan to give a copy to my clients' senior managers as Christmas and New Year's gifts. The principles that Nance Guilmartin teaches are imperative for unlocking performance potential in today's demanding economy and beyond." "All trademarks shown or referenced on this page are acknowledged to be the property of their respective owners."